Technology in the pipeline industry continues to improve year after year. More accurate inspection (ILI) equipment, higher strength steels, advancements in cathodic protection, and increased stakeholder engagement have fueled innovation. Like every industry, as improvements are made in one area, challenges may arise in another. The wide spread use of high strength steels, which allow for thinner walled large diameter pipes, combined with ILI advancements has brought the issue of ovality to the forefront. Ovality, also referred to as ‘Out of Roundness’ is one of the most common defects in pipe manufacturing. However, it is also becoming a more common occurrence on the construction site. Improper handling and pipe storage, uneven and rocky trench bottoms, and externally applied loads all contribute to an increased risk of pipeline ovality. 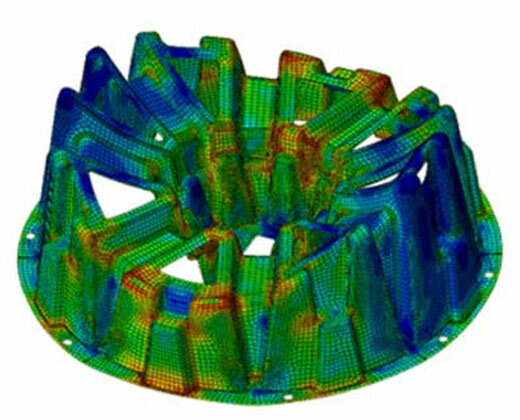 There are various methods of detecting and correcting ovality caused during the manufacturing process, but it becomes much more difficult – both to detect and correct – when it happens during the construction phase. Although it is important to improve methods of detection and correction of on-site pipe ovality, the most economical and beneficial way of combating pipeline ovality is prevention. To develop preventative measures, first the common causes of damage, and specifically ovality in the field, must be understood. 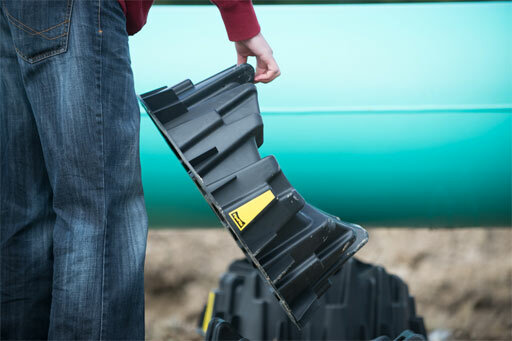 A major contributor of on-site pipeline ovality is point-loading due to uneven trench bottoms. Areas of pipe sag or overbend, where it is difficult to match the trench excavation to the exact curvature of the pipe, may result in a lack of support causing excessive stress on the pipe. Areas of soil transitions such as at tie-in welds and road crossing locations are also of concern. It is often difficult and impractical to match the compaction beneath the pipe to that of the consolidated/virgin soil transitions. Differential settlements has the potential to increase the stress on the pipe and increase the risk of ovaling. Rocky terrain, frozen soil and even compressed sand bags have often resulted in dents or excessive ovality. The common denominator when it comes to pipeline ovality during construction is improper, inadequate, or non-existent pipe support. When it comes to common support methods such as sandbags or sand bedding, they present as many issues as they solve. When sandbags are chosen as a support method, a critical assumption is made: the sandbags will be arranged as per the engineered drawings to create a well-formed pipeline support. However, the reality on-site is often quite different, with sandbags being haphazardly thrown into the trench resulting in an uneven and inadequate support area. Improper arrangement of sandbags may cause the very thing they are trying to address: hard spots, and point loading. All of which may lead to or contribute to excessive ovality, if not more severe damage to the pipeline like denting. Sand bedding is another common support method, which uses an uncompacted layer of select material, usually sand between four and six inches thick. The pipe is laid directly onto the bedding. Sand bedding can be problematic in multiple ways. First, if the sand bedding becomes compacted prior to the pipe being placed, it must be loosened by removal and replacement or by scarifying otherwise the pipe may be damaged due to hard spots in the bedding. Second, since the bedding material is uncompacted, there will be some slight settlement of the pipe when the pipe is laid on the bedding. The amount of settlement varies depending on the choice of bedding material, the type of pipe, diameter of the pipe, and surrounding native material. Settlement of bedding material is unpredictable, difficult to account for, and may lead to excessive stress if the degree of settlement varies significantly between adjacent areas. However, the most severe issue with sand bedding is soil migration. Over time, sand bedding often migrates away from beneath the pipe. Soil migration may occur at different rates along the length of the pipeline which results in an uneven trench bottom and contributes to excessive stress in the pipe. In the areas where the bedding has entirely migrated away, the pipeline rests unsupported on rocky trench bottom – the very thing the bedding was designed to avoid. The ideal pipeline support is something that is easy to use, requires little oversight during placement, and mitigates the risks described above (ovality, hard spots, denting, uneven settlement, soil migration). There is only one permanent pipeline support which fits the above criteria – the PipePillo. The PipePillo is lightweight, allowing it to be installed by a single worker from outside of the trench. 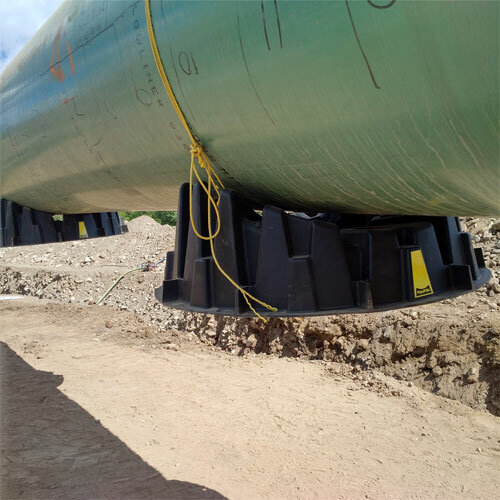 Its unique design and material combine to create an extremely strong support which is softer than the pipe and its coating - so it won’t damage the pipe - reduces the risk of cathodic shielding, and out-performs most pipe bedding options with zero risk of the support migrating away. PipePillo’s are completely inert and have no risk of deterioration over the life of the pipeline. Most importantly, PipePillo’s full 90° of support has been third-party tested and proven to help the pipeline resist ovality even better than continuous compacted sand bedding. PipePillos are being specified by many owning companies in North America and are routinely chosen by contractors as their preferred support method due to their ease of use, low cost, and long-term benefits.